GOP frontrunner Donald Trump, preparing for his second debate on Wednesday, has never declared bankruptcy. His businesses have, though -- four times. Find out what went wrong. NEW YORK (TheStreet) -- Donald Trump has never declared bankruptcy, but his businesses have -- four times. The real estate mogul, television star and Republican presidential frontrunner filed for corporate bankruptcy in 1991, 1992, 2004 and 2009. 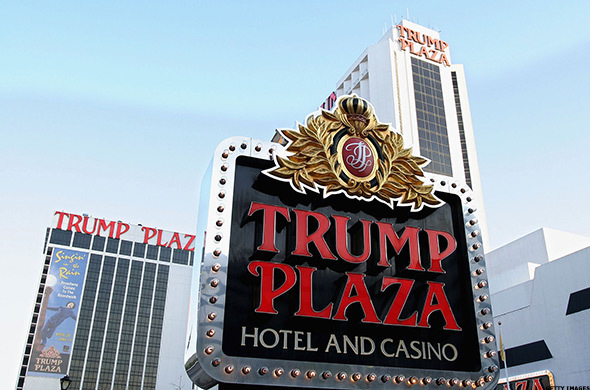 Three of the cases were related to his casino and hotel properties in Atlantic City, N.J.
And even though more than six years have passed since Trump had his last run-in with Chapter 11, it remains a touchy subject. Trump was quick to clarify at the Republican presidential debate hosted by Fox News in August that he had never filed for personal bankruptcy. Instead, he cast his moves as part of his solid business acumen. "Out of hundreds of deals -- hundreds -- on four occasions, I've taken advantage of the laws of this country, like other people," he said. "The difference is, when somebody else uses those laws, nobody writes about it. When I use it, it's like, 'Oh, Trump, Trump, Trump.' The fact is, I built a net worth of more than $10 billion. I have a great, great company. I employ thousands of people. And I'm very proud of the job I did." A Trump spokesman said many of the filings occurred when Trump was no longer involved in the businesses, blaming them on the declining casino market in Atlantic City. "It's not fair to judge anyone of his success, and the empire that he's built, on a particular investment without also looking at all of the great success he's had," he said. Trump's first corporate bankruptcy, for the Trump Taj Mahal, was the one that stung the most. It was also the only time at which his personal finances were at stake. Trump first got his hands on the property in 1988 as part of a deal involving media mogul Merv Griffin. Trump ceded his controlling interest of Atlantic City hotel-casino company Resorts International Inc. to Griffin in exchange for ownership of the Taj Mahal. The casino opened in 1990 to enormous fanfare, including an appearance by pop star Michael Jackson, who Trump called his friend and a "tremendous talent" (you can see a video of the pair's casino walkthrough here). Just days after opening its doors, the Taj Mahal hit a glitch: Its slot machines came to a halt, as money was coming in too fast for cashiers to keep up. The Trump organization also shook up the casino's executive team. 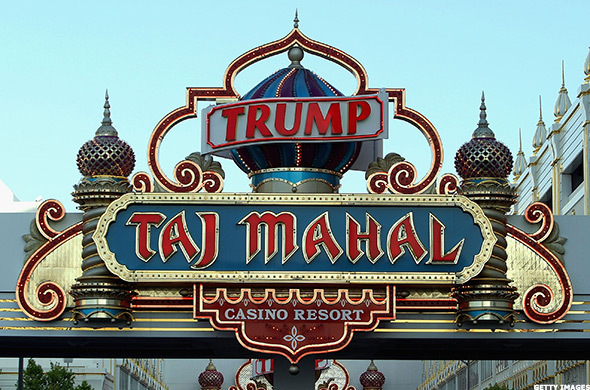 By 1991, Trump's corporation had filed for Chapter 11 bankruptcy protection from creditors of the Taj Mahal Casino Resort, which had cost $1 billion to build. Unable to pay the high interest rates on the junk bonds used to finance the resort's construction, Trump was forced to surrender half of his ownership interests in the property to bondholders in exchange for their acceptance of lower interest rates. The only hiccup in the expedited six-week restructuring process came from a company called Dixie-Narco, which had supplied 1,350 bill-changing machines to the Taj Mahal, according to a New York Times report. Dixie-Narco said Trump had improperly solicited bondholders by saying its $6 million claim was worthless. The two sides reached a settlement for $2.4 million, with the Taj Mahal agreeing to give back 500 of the machines. The Times also reported that Trump faced about $900 million in personal liabilities, which he reduced to about $550 million by the end of the year. The ordeal led to the sale of his Trump Princess Yacht and Trump Shuttle airline. It provided an important lesson as well. Ted Connolly, a Boston Bankruptcy attorney who studied Trump for his book The Road Out of Debt: Bankruptcy and Other Solutions to Your Financial Problems, told TheStreet in an August interview that the first bankruptcy was a learning experience for Trump. "The first business bankruptcy, he had a lot of personal liabilities, guarantees on the business debt, which would have wiped him out," Connolly said. "What he did was leverage the amount of business debt to negotiate away his personal liability. And from that, he learned not to put his personal wealth at risk anymore. And so in the next three, he didn't have any personal guarantees." Through the ordeal was bruising for Trump, one person involved in the case said his brand and persona helped him to retain more equity than he might have otherwise. And in true Trump fashion, he denied being too concerned about the issue anyway. "You'll never see me sitting in the corner sucking my thumb," Trump told BusinessWeek at the time. "The name Trump will be hotter than ever." Trump bought New York's Plaza Hotel for $390 million in 1988, promising to turn the then 81-year-old landmark into "the most luxurious hotel in the world." He told the New York Times that his wife, Ivana, would become president of the hotel with a salary of "$1 a year plus all the dresses she can buy." Four years later, Trump and Ivana had split, and the hotel had millions of dollars in debt. Trump seems to have had an inkling from the get-go that the Plaza deal may not have been the best he ever made . "I haven't purchased a building, I have purchased a masterpiece -- the Mona Lisa," he wrote in a 1988 essay in New York magazine. "For the first time in my life, I have knowingly made a deal which was not economic -- for I can never justify the price I paid, no matter how successful The Plaza becomes." 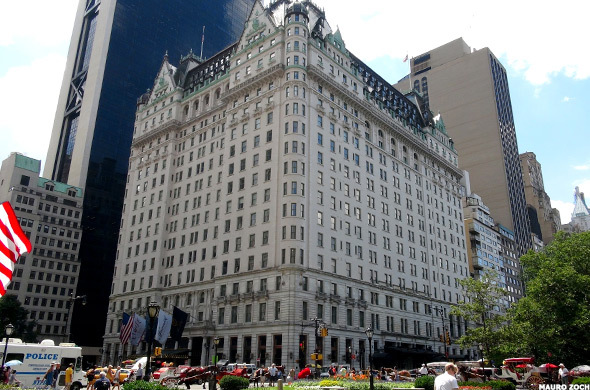 In November 1992, the now-billionaire filed for bankruptcy protection for the Plaza after the hotel was unable to meet its debt service payments. A month later, federal bankruptcy judge Prudence Abraham approved a plan for Trump to reorganize more than $550 million in debt. As part of the restructuring and to receive easier payment terms, he gave a 49% stake in the property to Citibank (C - Get Report) and five other lenders. He kept his post as chief executive -- without pay -- and no longer had a role in the day-to-day operations of the luxury hotel. Three years later, in 1995, Trump made a deal to sell the Plaza to Singapore-based international property and hotel conglomerate CDL Hotels International and Saudi Arabian Prince Walid bin Talal. The deal largely entailed buyers paying off most of $300 million owed to creditors, according to the New York Times. The last $25 million was to be converted to equity held by a Citibank-led consortium, and the buyers also agreed to pay down the first mortgage on the property, held by the Industrial Bank of Japan. Trump remained a minority partner at the Plaza. Trump managed to steer clear of bankruptcy for more than a decade before having another run-in with Chapter 11 in 2004. Trump Hotels and Casino Resorts, a holding company for the Trump Plaza in Atlantic City and a Gary, Indiana, riverboat casino venture, went public in 1995. It raised $130.5 million through an offering of 10 million shares. 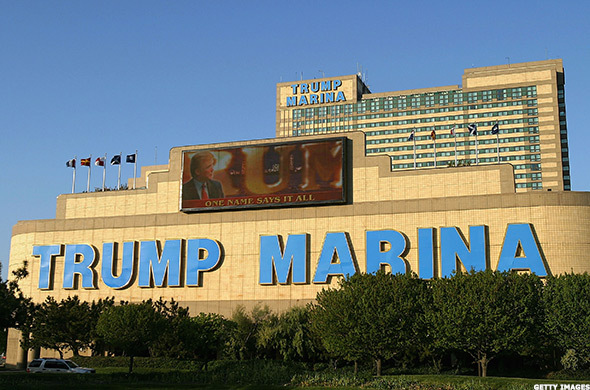 Nine years later, the entity had brought Trump Marina and Trump Taj Mahal in Atlantic City under its umbrella, along with the Trump 29 Casino in California. It had also accumulated $1.8 billion in debt and was facing stiff competition from the Borgata Hotel Casino and Spa, which opened in 2003. Trump Hotels and Casino Resorts filed for bankruptcy in late 2004. Under the subsequent restructuring plan, the Associated Press reported at the time, Trump said he would reduce his stake in the entity to 27% from 47% and cut debt by about $500 million. He also said that the interest rate on debt would be reduced to 8% from 15% and the company would be able to draw on a $500 million credit line at 4% interest. "I don't think it's a failure, it's a success," he said. "In this case, it was just something that worked better than other alternatives. It's really just a technical thing, but it came together." The third bankruptcy didn't appear to bruise Trump's ego. At the end of the year, he said in an interview that the Trump brand was bigger than Pepsi (PEP - Get Report) and Coca-Cola (KO - Get Report) and emphasized that Atlantic City was just a drop in the bucket for him. "The casinos represent less than 1% of my net worth, OK?" he said. "I'm doing something that, frankly, if someone else did it, it wouldn't even be a story." The fourth and most recent time Trump was embroiled in bankruptcy filings was in 2009. Trump Hotels and Casino Resorts emerged from bankruptcy as Trump Entertainment Resorts in 2005 and from the get-go, struggled to regain its footing. A 2007 Columbia Business School paper pointed to a number of red flags, including limited financials, new gaming competition in the Northeast, and aging casino assets that were gradually losing market share. When the 2008 financial crisis hit, the going got even tougher. Faced with declining revenues and failure to make a required $53.1 million bond interest payment in December 2008, Trump Entertainment Resorts filed for Chapter 11 bankruptcy in February 2009. The company listed $2.06 billion in assets and $1.74 billion in liabilities across its three casinos, including $1.25 billion in second-lien notes with an 8.5% annual interest. Just days before the filing, Trump and his daughter, Ivanka, resigned from the company's board, and he was quick to distance himself from the operation. "Other than the fact that it has my name on it -- which I'm not thrilled about -- I have nothing to do with the company," Trump told the Associated Press at the time. However, Trump wasn't ready to walk away all together. He joined forces with bondholders in a $225 million bid to maintain control of the company. As part of the plan, he was able to retain 10% of the company, the debt of which was reduced to $500 million. He also dropped a lawsuit against bondholders asserting $100 million in damages for breaches of the trademark licensing agreement and damage to the Trump brand. The Trump-backed plan beat another proposal put forth by activist investor Carl Icahn. "We're very happy, it's a great victory," Trump said in an interview with the New York Times. "Icahn wanted the name, but we made a deal with bondholders." While testifying in a New Jersey courtroom over the bankruptcy, Trump let it slip that maybe he's not as big a fan of Chapter 11 as he implies today. "I don't like the 'b' word," he said. Trump Entertainment resorts -- this time, without the Donald in tow -- filed for bankruptcy again in 2014.